The thing about Beda’s is that you keep going back. At least I do. It’s quickly become my “third place,” an oasis removed from work or home supplied with its own culture and cast of characters. You can hang out for hours with a beer and chew the fat with Beda Schmidthues himself, or you can scoot up to a community table and make a few new friends over authentic brats and sauerkraut. It’s amazing. People actually put down their phones and talk to each other! 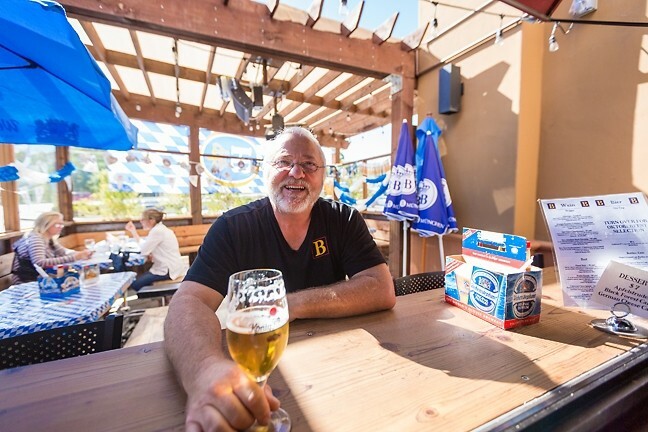 THE BIER MAN : Beda Schmidthues and his wife, Helga, are pouring their heart, soul, and delicious family recipes into the hearty offerings at Beda’s Biergarten. With open windows connecting the dining room to the covered patio, a meal here always feels joyful and light—even though the flavors are decidedly hearty. Maybe that’s because Beda and his wife, Helga, started out in their own backyard. Literally. For years, the couple’s family-style dinner parties were legendary in SLO. The modern German pub—which opened about four months ago at 3230 Broad St.—doesn’t stray too far from those backyard smorgasbords. You come. You eat. You drink. You enjoy the people you’re with. Only now, there’s a full kitchen to play with and a whole lot more beer. Beda grew up in Duisburg, located along the Rhine and Ruhr rivers in Germany (beer geeks should note that this is also the home of König Pilsener). The kitchen always symbolized a sense of comfort. Note: Those beloved, well-worn German dishes have found new life at Beda’s, which serves up satisfying slow simmered beef goulash as well as pork and chicken schnitzel, which is tenderized, breaded, and fried before being drizzled with delectable, creamy sauces. The rouladen—bacon, onion, and pickle rolled in sliced beef and paired with mashed potatoes and gravy—tastes just as good as when Beda was a kid. Thanks to a bit of refinement from Helga, it may even be better. Popular Berlin street food like currywurst collides with fresh sandwiches like the schnitzelbrot (chicken or pork schnitzel on a pretzel roll with caramelized onion, tomatoes, baby kale, and lemon aioli). Feeling famished? Order up the fresh-made spätzle noodles and choose your cheese, meats, and veggies, or go for the frikadellen—two tender, flattened spiced meatballs served with hot mustard. Pair it all with a frosty stein of Früh Kölsch, and you’ve got the right idea. As a college student, Beda said he was absorbed in two all-important things: “party” and “sport.” Between those two activities sat cooking—something he did less out of necessity and more because he absolutely loved it. “My mom cooked and my dad cooked, but I really learned cooking when I moved out and started cooking for myself. I have a huge collection of about 900 recipe cards I collected when I was 20. Life was simple back then,” Beda said. HOP ON : Beda’s Biergarten is a community effort brought about by friends and family of Beda and Helga Schmidthues. It makes sense, then, that the Beda’s Beer Bicycle was crafted by a group of mechanically inclined friends. You can rent the bike—Beda included—for any party or gathering in SLO. Soon, Beda found a fourth passion that would trump all else: his future wife, Helga, whom he met at business school. The pair soon moved to Helga’s hometown of Düsseldorf, and after honeymooning in Carmel in 1982, set their sights on California. What started as a far-flung retirement dream quickly accelerated into reality. “Two years later, with our 9-month-old daughter, Julia, a visitor’s visa, and a container full of furniture, we were here,” Beda said. They settled in the Bay Area, where they worked to build a life. In 1987, a chance trip through the Central Coast rerouted the family a little farther south. Daughters, Anna and Julia, son-in-law Todd Rogers, and their infant grandson have also grown roots in SLO (Julia is a server and manager at Beda’s, Todd works in the kitchen, and Anna helps wherever she’s needed). After 33 years of marriage, Beda and Helga still love working together. From 1966 to 2010, the couple part-owned a children’s book and art punlishing company called Rip Squeak and Friends. “Ever since we came to the U.S., we’ve never had separate jobs. I think the secret is that we have separate responsibilities,” Beda said. At the restaurant, Beda is certainly the face of the operation (he jokes that his initials read “B.S.” for a reason). Helga helps refine the family recipes and takes care of administrative work, although you can sometimes catch a glimpse of her in the dining room, where she chats with regulars. 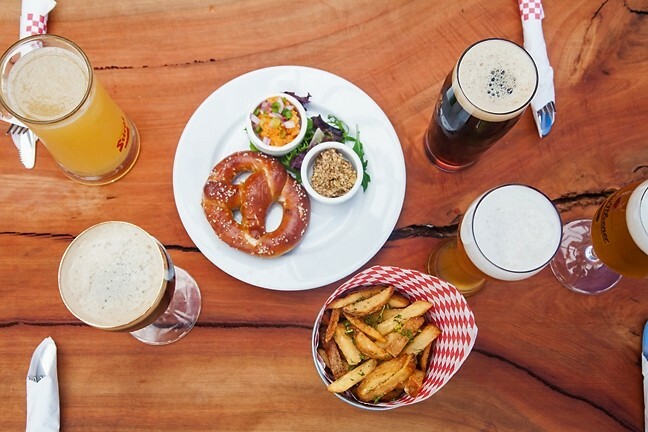 MEET YOU AT BEDA’S: Beda’s Biergarten serves up a rotating tap of imports, including König Pilsener, Früh Kölsch, Erdinger Weissbier, Köstritzer Schwarzbier, Weihenstephaner, and Doppelbock with a dedicated handle for California IPAs. Local wine and cider are also available and the eatery is open for lunch, dinner, and weekend brunch. Kids menu items—like the Spätzle Mit Kase (German mac and cheese)—are also available. Beda’s Biergarten is located at 3230 Broad Street in SLO. For more information or for hours, call 439-2729 or visit bedasbiergarten.com. Although family is a huge part of the operation, Beda is always quick to include his friends under that umbrella. Those friends didn’t just urge Beda and Helga to open their own restaurant—they helped physically build it. Now, those friends are loyal customers. “We thought, ‘If we have to work this hard for the rest of our lives, we’d better do something we enjoy,’” Beda said. If the sound of laughter that echoes through the pub on any given day is a sign, the crew is having a grand time. 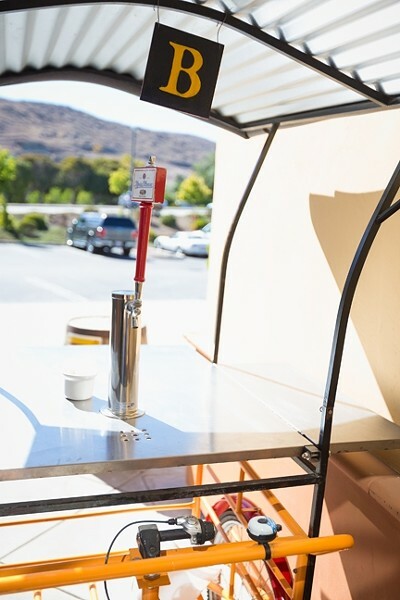 Did I mention you can rent a Beda’s beer bike for your next party complete with taps, glasses, and Beda himself? Of course, the bike was built thanks to a community effort. Hayley Thomas always recommends a pint of Stiegl Radler. Join her at hthomas@newtimesslo.com.